There are a lot of guys (and ladies) who like to travel and play golf in new places...and I know a lot of them travel to destinations to play a specific course. Unfortunately, course fees can add up, but there ARE ways to save! Some courses charge less for a less desirable tee time or day. If you only plan to golf a few times on your trip, consider renting your equipment. You won't have to drag your clubs everywhere you go or pay for checked baggage fees (or overweight fees). Check out GolfSwitch on Expedia for cheaper tee times that you can reserve and pay for in advance! Do you know of other ways to save on a golf excursion or know of inexpensive courses? Book a less desirable tee time or less busy day to get a discounted rate. Buy an Entertainment Book for your vacation destination (if applicable) or use your current one to look online and find discounts on golf where you are going. They mark the books down in February and March, so you get an even better deal, plus you can get cash back on your purchase of one with Ebates (17.5%!). Use Expedia to book a reduced tee time rate on GolfSwitch. They have a network of golf courses worldwide where you can book ahead of time, get a good deal and, because you paid in advance, only have to worry about showing up! Many courses give discounts to residents. If you know anyone in the area that you’ll be playing in, see if you can get them to book for you. Rent your equipment when you get there. No sense in dragging your heavy clubs everywhere you go if you’ll only be playing one or two rounds while you’re on your trip. You’ll save by not having to pay (overweight) baggage fees each way and you won’t have your bag taking up all that space in your room. Your back will also thank you. Groupon! Sign up for Groupon for free and get up to 75% off dining, shopping and activities. This includes greens fees. I have seen many Groupons for lovely golf courses in the Portland area, so I have to believe that you can find equally good ones for your home area and other U.S. and international destinations (where Groupon is offered). It doesn’t hurt that you may also see Groupons for other things you may want to see and do…or eat! So, hopefully that will help you keep some green in your wallet while you’re keeping your ball on the green! Bushnell Back Track personal GPS – I love this thing! Granted, I don’t have one yet, but it’s on my wish list and I’ll have it in my hands before my next trip. People who do have one have given it rave reviews. No guy wants to ask for directions (and some of us ladies have a terrible sense of direction, too). With this awesome little device, you can add your starting coordinates, like your hotel’s street entrance, and then while you’re off enjoying the day you can forget all about where you started and then use the Back Track to guide you back to that exact spot! This is fantastic for places that have large parking lots (Disney, anyone?) or if you’re meeting people back at a specific place or finding your bus stop again. This doesn’t work indoors though, so if you get lost in Mall of America or a parking garage, it can’t help you. Sony PSP – The PSP stands for PlayStation Portable, but it does oh so much more than play games. With the PSP you can store pictures, surf the web, listen to your MP3s, watch movies and use it as a GPS navigator. You can probably do even more that that, but this really is the ultimate do-it-all device. If it could also make phone calls and read books, you wouldn’t have to take anything else. I hear that Sony is working on such a handheld electronic. I hope they can also make it a touch screen (or at least let me use a stylus), because that’ll be my next purchase. Zagg aluminum iPad case with wireless keyboard – I know you guys love your shiny new iPads. Well, it can be hard to do actual work on those little things, given the weight and the ability to only type as fast as the touch screen allows and the fact that it auto corrects everything you don’t want it to and stuff you do it doesn’t. While the Zagg case comes with a bit of a high price tag ($99), it can solve all your keyboarding problems and keep your iPad safe. The keyboard is WiFi enabled, so no wires are needed to connect your iPad, plus, it props your iPad up like a monitor, so you don’t have to hold it either. Voila! You’re ready to work and write emails! Also, it only add ¼” to the bulk of your iPad, so shoving it into the outside pocket of your carry-on should be just as easy as before! iGo multi-charger – This will always be on the top of my travel gadget must-have list. I have several of them and the tips to go with all my devices, including the international mobile phones I have from Mobal. It’s just SO handy. It takes up minimal space (stuff it in a shoe to save even MORE space) and eliminates all your other adapters for your electronics, except for your netbook/laptop. They have iGos for those, too, but they are just as bulky as your regular adapter, so why not save the money and take that one instead? I have an iGo wall adapter, car adapter, splitter – so I can charge TWO items at once – and the USB plug, which allows me to charge something with the power from my netbook. All these components fit into a nice little makeup bag (my preferred mode of transportation for such things) and take up less space than just two of my regular adapters, that now live in the “cord drawer” at home. to win! More info to come! Kindle from Amazon – These handy e-readers are getting more and more affordable. With the money you save on books (they are less expensive in ebook format), this pays for itself pretty quickly. If you love to read, then the Kindle – or other e-reader – is a must! I found that I was always taking at least two books with me every time I traveled. If my husband was reading something, we would add another to the pile. Well, now with the Kindle, we take just the Kindle and a few magazines. Such a space saver! We can take (almost) all the books we own, plus newspapers and blogs with us in that one small package. If we both want to read at once, it’s not a big deal, because with the free Kindle reading apps downloaded on both our iPod Touch and iPad, one of us can read a book on the Kindle and the other can read on one of those other devices. Not only is that cool, but it’s SUPER cool, because the app syncs with your Kindle account and remembers your place. So, if I start reading on the Kindle and then have to switch to reading on the iPad, I won’t have to flip through to find my page. The only way this works badly is if you both want to read the same book at the same time. Luckily, we don’t have this problem. the Shereen Travels Cheap blog on yours? No? Well, you can! enjoy STC at home, at work, on the train, in France! other web-enabled devices (iPad, Blackberry, Android, etc.). Do you have more to add to my lists? Comment here or run over to the Frugal Living Community and join the discussion with me and my other frugal friends. You can join other discussions, too, and learn how to save money on fashion, groceries, travel and more! Blog Frog is a fantastic site that is comprised of bloggers and blog readers who share the same interests. In addition to joining different communities (Frugal Living is NOT the only one, just the one where I am a community leader and share most of my money-saving ideas), you can find other blogs that interest you, interact with other bloggers/readers and make new friends. So, as I said above, Ebates is sponsoring “man week”. What does that mean for you? 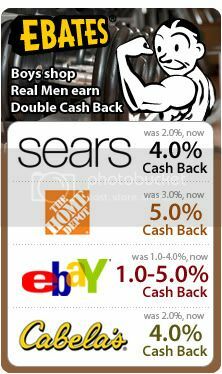 Besides fun topics on golf, couponing, gadgets and other things men like, they are offering double cash back on some of your favorite online retailers! One of my favorites, Backcountry.com, is on the list this week for 8% cash back. They sell a wide range of travel clothing and accessories for men, women and children! Got some outdoor things you want to do and need supplies? Backcountry is sure to have it. Man Week ends on Monday though, so make sure you order by then.